Patricia Pedreira is a Sales Representative with Royal LePage Binder Real Estate who brings a personal commitment to all of her real estate transactions. Clients choose her because of her ability to listen to their wants and needs, the way she takes personal responsibility for finding them the perfect home, her dedication to their satisfaction, and her honest advice about when to buy or sell. From her solution, she needed not only branding and web design to reflect her approach to real estate, but also online marketing to make sure that these messages reach potential clients. 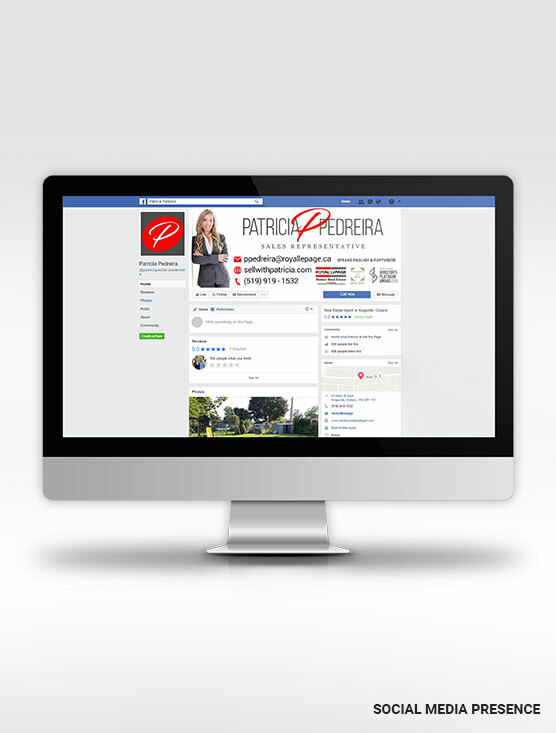 Patricia began with branding and a custom real estate solution website in 2014, and after a few years as her real estate business grew, she turned to us for an update to her brand and online presence to better reflect where she was now. We created a new brand for Patricia, featuring a colour to match her brokerage and a simple but distinct new logo that can include her name or just include a badge. With her new logo and brand direction set, we updated all of her branding items, including her yard signs, business cards, and social media graphics to reflect the update. We then redesigned her custom real estate solution website to match her new brand and give her a professional, modern look. 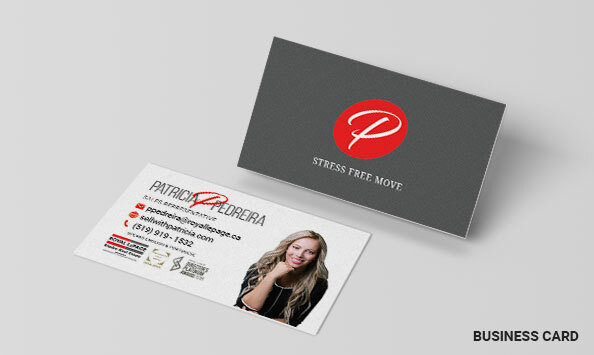 As part of her re-branding and the redesign of her website, we worked with Patricia to identify a unique marketing message that could be delivered to potential clients to help encourage to want to work with Patricia. We decided on marketing how Patricia can provide her clients with a stress-free move, including the use of one of her trailers for free when you buy or sell with her. This message delivers a clear statement to potential leads about how she can make what can often be an intimidating process in moving and make it easier on her clients in addition to her other areas of real estate expertise. This messaging is not only clear and visible on her website, but also on her other branding items, including unique items like the custom vehicle wraps that we designed for her. This messaging is not only clear and visible on her website, but also on her other branding items, including unique items like the custom vehicle wraps that we designed for her. We also continue to deliver her message about a stress-free move, and her other messages about real estate through ongoing social media marketing services to let followers and new leads on Facebook know about her latest promotions, properties, and events. We have designed custom Sold Property graphics for Patricia to help her highlight the homes she has recently sold for her clients and have helped her conduct giveaways and announce special events directly through social media to help get her name out to more leads and increase her brand recognition.